Yann is an employee of Hermes News, where he works alongside rising young reporter April O’Mally. He also helps her with her side job: uploading illegal hotstim’s of her shadowruns. He is careful to edit out identifying details of other participants, and assigns each a uniform color, so that they can be followed by fans throughout multiple runs. He also edits the sims for maximum intensity. He and April run a subscription service to distribute these sims. 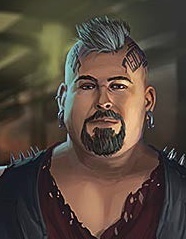 Yann is chubby, and fairly introverted, although he is extremely loyal to April. Killed while piloting a Hermes news chopper over Longpig’s fortress.